my lovely dad and Me ! 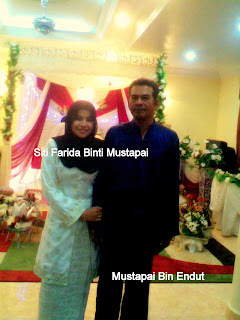 My dad Mustapai Bin Endut, is a five-star dad bcause he's cool. he's funny. my hero is my dad bcause he's special to me ! he works very hard during the week n spends lots of time with my siblings. he will anything to me ! he cheers me up when im sad i love my dad !!! he never gives up n he helps me in any way he can. he tries make me happy. he helps me n teaches me right from wrong. cheers ! i love my daddy, who has never hurt me *really?. always respected me n understands me ! the story of my dad. let me start saying, "daddy, u r my inspiration". like many fathers, he will occasionally nag at me for my homework or school, but deep in my heart i know that he's a very good father, who is responsible, hardworking, loving, n will forever be my role modal. i respect him because he's very caring. he takes care of me and my siblings so well, n we rely on him so much. sometimes, he always congratulates me when i do something. i really love my dad. i have a lot guy friends, n he's so protective. my dad is a really awesome person, n i want everyone to know that he's the greatest dad. lastly, my dad is very hardworking. he does many things to help us and our house. i think he's the best dad, n he deserves a great Father's Day surprise. Why The Student Skip Class?